When I moved to Louisville, it wasn't long before I heard about the dynamic duo of the local food scene, Maggie Keith and Lindsey McClave, also known as The Farmer and The Foodie. Maggie (The Farmer) totally threw my existing mental image of "farmer" threw a loop, when I first saw her speak at a panel on health and wellness. It was so refreshing to see a kick-a$$ boss babe entrepreneur donning a pair of blue denim overalls (and baby bump!) at a young professionals networking event. Maggie glowed as she passionately spoke about the sustainable and ethical farming methods being used at the 1300 acre biodynamic Foxhollow Farm. Lindsey (The Foodie) is hard to miss for those of us who are always chasing the newest restaurant opening. As the food critic for The Courier-Journal, she shares her experiences through the lens of a well-traveled culinary expert and level one Sommelier. This self-taught home cook and food blogger turned her passion into a full time flourishing career, and is an inspiration for anyone looking to follow their dreams! I have been lucky enough to get to learn from and collaborate with these wellpreneurs through our joint work with Slow Food Bluegrass, going on their radio show/podcast and sharing our love of food in Louisville, KY. 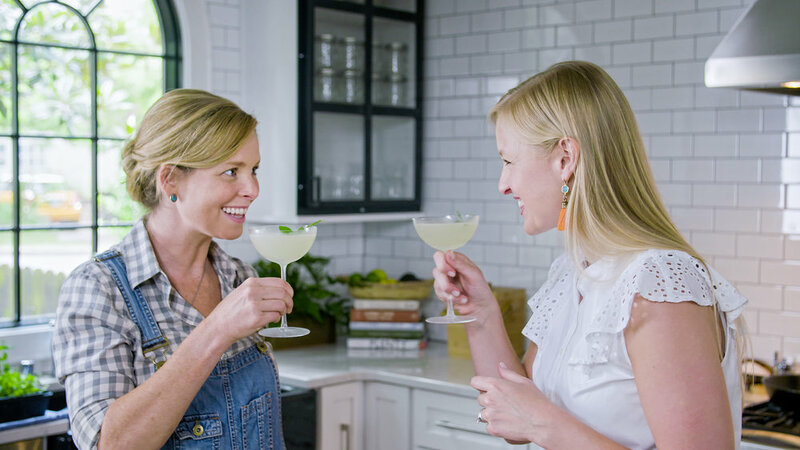 I am so thrilled to get to share more about them as we countdown to the first season of their cooking and lifestyle show, The Farmer & The Foodie, airing on KET this Spring. How did you develop your passion and interest in food and bringing the value/joy of good food to the community? The Farmer: I first became interested in farming food that is healthiest for the animals, healthiest for our farm-land, and healthiest for us as consumers after reading Omnivore's Dilemma by Michael Pollan in 2007. I further developed my passion for growing food after moving back to my family farm and working the land. It brings me such joy to grow food from scratch and know that families are enjoying that food and nurturing their bodies. The Foodie: My relationship with food was born out of a need to escape the rigors of my day job. I would pour myself into cooking when I got home, shaking off the day while giving over all of my focus to learning something new. I quickly found myself daydreaming about what new recipe I was going to attempt when I got off work and what sort of wine I would try. As I became more comfortable in the kitchen I knew I wanted to do something more with my new found passion and decided to start a blog. When Maggie and I met the creation and evolution of The Farmer & The Foodie just made sense. Where and when did your collaboration begin? What unique skills do each of you bring to your partnership? The Farmer: We met in 2009 at a cocktail party Lindsey was hosting at her house. She had cooked a delicious spread of food and I was so impressed by her homemade cooking and passion for feeding people. We quickly became friends and every time we got together we would endlessly discuss what we were eating, cooking, drinking, and growing. The conversations got more and more interesting as our friendship grew and my skills as a farmer grew and her skills in the kitchen grew. We began recording a podcast in our home with my brother (George Barrett of Homepage Realty) in 2013 and then in March 2014 moved to Crescent Hill Radio and have had a weekly show ever since then. Lindsey has this incredible way of making cooking sound fun! She has a deep understanding of recipe development and being a home cook as well as a lot of knowledge about wine. I have been farming at my family farm for over 10 years and have gained the knowledge to understand and articulate the rhythms of Kentucky Farmland. I understand the seasons, the farmers’ perspective, and the need to bridge the gap between farmers and home cooks. Where do you find motivation and inspiration? The Farmer: I find motivation in the woods, pastures, and gardens. My favorite thing is to get up early and watch the sunrise in one of the pastures with the cattle. Everything is still but the cattle munching the grass and stomping the grass with their hooves. The Foodie: Travel offers me inspiration a million times over. Whether it be to various corners of Kentucky or across the world, there is always something distinctive to discover that defines a community. That ‘thing’ is almost always food. Tell us about your podcast and show! Where can we find the Farmer and the Foodie? What advice would you give other wellpreneurs starting out on their journey? The Farmer: Just do it! Lindsey and I did not have this huge plan when we first started our show together. We started in a tiny room in our condo building with this pathetic microphone and laptop setup. We didn’t know if anyone would listen or if it was any good but we recorded a few shows to get the hang of it. Next thing we knew we had a radio show on a local station and then now have a TV show we are about to launch on KET in Spring 2018. With enough passion anything can happen. I had so much fun making short ribs for the first time with their delicious taco recipe! I asked Maggie and Lindsey for their favorite recipe and they shared a recent favorite, Foxhollow Farm Grassfed Beef Short Rib Tacos! Making Short Ribs for my first time as a mostly plant expert was intimidating at first but so worth it. I used grain free coconut/cassava flour tortillas and almond milk crumbles to make this recipe gluten free, dairy free and paleo. Hope you enjoy it as much as I did! Aminata Clason-Diop, a Swedish native with a business background and passion for health and fitness, has woven together an all encompassing wellness program on the island of St. Barthelemy. 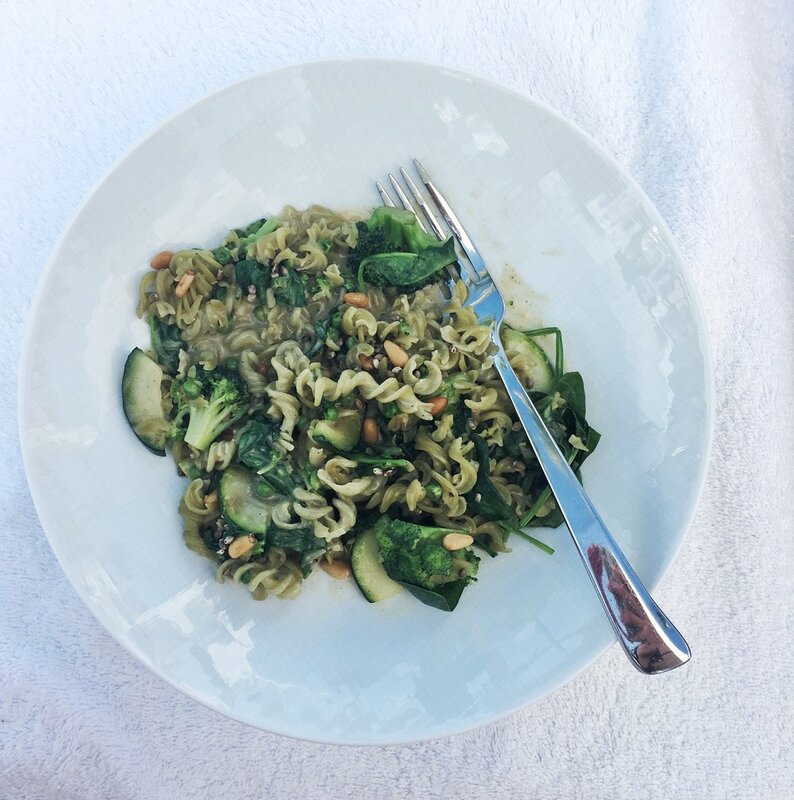 She shares a favorite recipe from her Eden Rock St. Barth Wellness menu. Travel and wellness are not always a natural intersection. For those of us who prioritize wellness, we take the time to plan away doing tireless research on where to schedule our morning workouts and find the closest juice bars to our future destination. For many locations, especially in urban city centers, this can be a piece of [vegan, gluten-free] cake. However, often times even the most luxurious of destinations completely neglect this growing need. Aminata Clason-Diop, a Swedish native with a business background and passion for health and fitness, has woven together an all encompassing wellness program on the island of St. Barthelemy. Like many other wellpreneurs, years of health struggles drove her to make a change for herself, and then figure out how to deliver the same effective remedy for others. Her unique expertise in both health cuisine and fitness has enabled her to create an oasis where wellness meets luxury. Guests to the epic Eden Rock resort or any visitors on the island who visit the property do not have to think twice about compromising their health in order to indulge in a relaxing and pleasureful vacation. From the perfectly crafted juice bar menu with everything from vegan protein shakes to health shots and detox juices, to her vegan, gluten and processed sugar free gourmet wellness menu, health nuts are able to start their day with an energizing maca shake and end it with dairy free coconut and chocolate ice cream. So how did she end up pulling all of this together? After finishing studying business at Baruch College in NYC, Aminata decided to follow her passion and learn more about how to bring others the relief she got from engaging in a health conscious lifestyle. Her knowledge of yoga comes informally from practicing while traveling in Bali and formally from the well known Chrissy Carter Yoga Works teacher training offered in Manhattan. She continued her training by becoming certified in SUP Paddle Yoga in the Hamptons, which is also offered exclusively by her program through Eden Rock. Her formal training in vegan gastronomy comes from a household name in the nutrition world. Studying under world renowned plant-based chef Matthew Kenney more than prepared Aminata to bring back health conscious cuisine to the island she calls home. She also studied both nutrition and wellness at the Institute for Integrative Nutrition. Visitors and locals alike are inspired to practice wellness as a lifestyle through her wellness club. She offers 9 different fitness classes per week as well as nutrition consultation and cooking classes, which have all been a big hit on the island. Scroll down for Aminata's recipe from the Wellness menu that she created for the Eden Rock St. Barth. The creamy, indulgent tasting pasta is completely plant based and full of flavor. I couldn't help but ordering it daily and was not surprised that even my typically carnivorous travel mates couldn't get enough. Next up for Aminata is an althleisure collaboration that will be sold exclusively through the Eden Rock St. Barths. Ready to plan your visit? Click the button below to book through my agent and receive an exclusive wellness package. Bring water to boil, cook pasta as indicated on package. Drain and rinse in cold water. Bring water to boil and cook green peas for 3 min. Drain and rinse in cold water. Put peas aside with pasta. Add olive oil, onion, and garlic to pan, cook for 1-2 min. Add broccoli, zucchini, salt, black pepper, and white pepper. Let cook for 2-3 min. Add rice cream, herb salt, red paprika, curry, chili flakes, thyme, and lemon juice. Let cook for 1-2 min. Fold in spinach, green peas, and pasta. Serve warm and garnish with pine nuts, hempseeds, and parsley. A busy mom and entrepreneur, Salty Bath Co-Founder Tami McCarthy believes that women need to nurture themselves emotionally, physically, spiritually and mentally. The positive impact of having a self-care routine on her life gave her the idea for the Salty Bath concept. Opening the salty bath kit is a relaxing experience in itself, as you are immediately greeted with the mantra: I am at peace, whole and balanced. A busy mom and entrepreneur, Tami believes that women need to nurture themselves emotionally, physically, spiritually and mentally. "I am one of those reformed crazy-busy people – juggling a family, a career and many creative pursuits, and I fell into the trap that I as long as I was taking care of everyone else, I was fine. That’s just self-abuse, and I needed to make changes., " she explains as her own beiefs on self-care . Tami makes the comparison of humans to electronic devices that always take the time to "recharge," saying that we too need the time to nurture and recharge ourselves. I have to admit that after receiving my Salty Bath kit in the mail, it took me weeks to use it. I kept putting off taking a bath thinking that I did not have the time until made a point to schedule it in my day as a priority. Never one to relate when people describe lacking the time to exercise or cook (because to me it is about making the time), I was doing the same thing about scheduling time for self-care, which is just as essential to overall health and well-being. That is why I love the concept behind Salthy Bath. it not only delivers the tools you need to make a relaxing space and practice, but also the step by step directions for doing so. Sit, breathe deeply and recite you bath intention, relax and soak away stress and fatigue while breathing in the healing aroma of powerful botanical essences to harmonize your world, body and soul. Elevate your after bath experience by using essential oils and other bath products to feel completely restored, refreshed and nourished. Give yourself a hug, these were important sacred moments you gave yourself. Bath soak, body cream, lemongrass essential oil, candle and crystals were this month's Salty Bath kit for a relaxation and self-care ritual. From Chia Seed Peanut Butter to Hazelnut Cranberry Butter, Bliss Nut Butter's founder Daniell Bliss has created the 'holy grail" of nut butters. Her sweet and savory Hazelnut Crusted Salmon is an absolute must try recipe! Three of Bliss Nut Butter's unique, addictive products. Love the sunflower seed butter with banana and chia and the cashew butter with strawberries and raw coconut flakes. Why Bliss Nut Butters? What inspired you to create this health food line? I have degree in public health and have always had an acclivity towards health and nutrition. Five years ago as an avid trialthloner who had a couple of marathons under my belt, I was fueling my body with nut butters for my long runs. "Grind your own" was boring, but I knew that I didn't want Jif or Skippy (JUNK), so I starting making my own. I added the honey for the slow releasing "good" sugars, the sea-salt for the minerals, and it turned out to be pure "Bliss" (plus that is my last name!). I was giving them away as gifts and my husband's mother said we should start selling these. I looked at her like she was crazy, but my husband said let's give it a go. Here we are 5 years later with 7 sku's, 10 states, 500 stores, 14 farmer's markets and our own production facility. We are a husband and wife team, working to grow our brand organically. What makes Bliss Nut Butters unique in terms of your products and company? We are unique because we do a fresh ground process. Most nut butters are milled, but ours are course ground, which lends that beautiful texture. We also use glass jars and have a local recycling program where we sanitize and re-use our jars! We source renewable energy over all lowering our carbon footprint (we just pay more for wind or water energy in the Northwest). What is your wellness philosophy? How does the nutritional value of your products play into that? Nutrition and overall wellness is a huge part of our business. As a matter of fact, I am starting to study for my nutrition therapist license. We believe that 80% of health is through nutrition but it is a full circle of balance from spiritual, mental, exercise and overall well being. I am always telling people that not all fats and sugars are created equal. I try to make sure we only use natural sugars, even the cranberries are sweetened with unsweetened apple juice. I love how each nut has different health properties and honey is so great in many ways! Sea-Salt is so important as well. Can you share a favorite recipe that uses one of your nut butters? I have so many, I would have to say it is a toss up between the salads and the squash. I try to create simple healthy easy recipes that fit into everyone's schedule. Our Sunflower butter with balsamic, dried figs and fennels tossed with greens is a great salad too. I tried and made a few Bliss Nut Butters Recipes and the Hazelnut Crusted Salmon was my favorite! I used 2 cloves of garlic, hazelnut butter and oil, as suggested. The recipe gives crushed red pepper as an optional addition. After crushing the cloves and combining, I spread the mixture onto the filets. After being baked for 10 minutes at 425 degrees, the hazelnut crusted salmon goes perfectly alongside some raw greens dressed simply with olive oil, lemon and herbs. Co-founder and CEO of LoveBug Probiotics, Ashley Harris shares her inspiration for the company, the latest technology behind her line of probiotics and tips for improving digestive health. What inspired you to start LoveBug Probiotics? Three years ago, after the birth of my son, I started to get sick. With what, I wasn’t quite sure. All I knew was that I was tired all the time, was getting migraines a lot, and my scalp, eyes, and ears started to itch on the daily. Then one day, out of the blue it seems, I got eczema all over my legs. Something definitely wasn’t right. I reached out to friends and friends of friends who were doctors, nutritionists, and even scientists. Luckily, I found an amazing team of doctors who tested me for what seemed like anything and everything. It turned out that all these weird symptoms were all related to problems originating in my gut. Turns out I had Celiac, Candida, and leaky gut all at once as well as a complete imbalance of good bacteria compared to bad living in my system. Absolutely stunned by this outcome, I made my husband get his own lab tests done as well. Turns out his good to bad bacteria ratio was just as bad as mine! We immediately started taking probiotics and began to notice an amazing shift in our health. Curious about this bacterial imbalance, we began conducting research and found out that it wasn’t just us suffering from suffering from this. In fact, most people’s gut bacteria is severely off-balance due to the antibiotics we are prescribed and eat, pesticides and chemicals we’re exposed to, and the processed foods we Americans seem to eat on the daily. Inspired by the power probiotics had on our health, my husband and I decided to develop our own line of premium probiotics using only the best of the best strains, delivery technology, and working hand in hand with world class scientists who research the Human Microbiome Project. Why probiotics- and more importantly- why Love Bug probiotics? As I said before, we are surrounded by antibiotics. Sure, antibiotics are a great thing to have when you are sick, but they tend to wipe out all your bacteria in a scorched-earth style, including those precious good bacteria. Many people don’t know that they have to take antibiotics in conjunction with probiotics to replenish their immune system during the healing process. This is why many people relapse with their illnesses. Trends also show that doctors have a tendency to overprescribe antibiotics to patients, meaning an increase in weakened immune systems on a mass basis. A weakened immune system paired with additional antibiotics injected into the meats we eat, over processed foods, and chemicals and pesticides making our way into our bodies is not good news for our health. In fact, many studies have correlated a poor microbiome with things such as allergies and asthma, to more serious diseases such as ADD, autism, Colitis and Crohn’s Disease. Basically, think of probiotics as an army of bugs who march into your body and kick out all the bad bugs that are making you sick and uncomfortable. Your gut is called your ‘second brain’ for a reason, so just as you make sure to wear a helmet when you ride a bike, you need to shield your gut from any harm to maintain a functional, healthy body. LoveBug Probiotics is completely unique to other probiotics on the market. First of all, we use BioTract Technology, which ensures that our probiotics are released in your gut, where they are most needed, making our probiotics 15x more effective than other brands. Many probiotics that do not use this technology are basically ineffective because they tend to break apart in your stomach acid before they have the chance to even reach your gut. We’re also one of the only probiotics out there that are non-GMO, gluten free, sugar free, soy free, lactose free, nut free, and don’t use any artificial coloring or flavors. We also have three specialized formulas for different ailments, from your generic digestive issues, to not-so-fun things like UTIs and Yeast Infections. Also, did you see our bottles? Gorgeous! We also just released a children’s line for infants and toddlers! Our son takes them and loves them. I can’t stress how important it is for children to get a head start in developing their microbiomes. A child’s microbiome begins during birth. Between the ages of six months and three years old the number of different microbial strains increases from just 100 to 1,000 and by three years old, a child’s microbiome resembles that of an adult. My little one just turned three and is about to start preschool. We know that before we send him off that he needs to be healthy and strong, and our formula pretty much has him prepped for pre-K, germs and all! What are other ways that you maintain a healthy microbiome in your diet? Maintain a healthy lifestyle. Know what’s in the food you are eating. I only buy organic produce, foods, and meats to make sure my good bacteria aren’t being hurt by additives and antibiotics. I also find yummy ways to get an extra dose of probiotics in my diet. A lot of my friends like eating kimchi and organic Greek yogurt. I personally love drinking Kombucha! I haven’t tried my hand at making my own yet, but I love the Health-Ade brand! Founder, Chad Rosen shares the benefits of hemp products on health and the economy as well as his favorite hemp based recipe- Spicy Hemp Basil Pesto. There are endless ways to use hemp seeds to pack some extra protein. I love them sprinkled in breakfast favorites like smoothie bowls and oatmeal. What inspired you to start Victory Hemp Foods? How have you overcome any challenges you have faced on your journey and do you have any advice for other "wellpreneuers"? If hemp has 25,000 different uses I could probably give you close to as many reasons for what drives my passion to see this plant come into the rotation responsibly. I believe in the rhetoric of what’s possible with this plant from paper, to textiles, to graphene, to food, to construction materials… replacing our fossil fuel based economy with an agriculture based economy, and one that doesn’t rely on synthetic chemicals for production is more than possible, it’s scalable. There are a lot of people in this industry working in different directions, some will be successful with those technologies and it’s exciting to be a part or, even distracting at times! Without a doubt it hasn't been an easy road, we're building an industry that has legal barriers, social stigmas, under developed markets, and fierce competition from abroad or even from similar commodities. Kentucky is an Ag state, lots of good soil, sun, water, and farmers, mix that with strong support from political leaders and it seemed like a great place to germinate a business in Hemp. When you start to unravel the economics and the motives that legislators here in Kentucky had for aligning the laws to allow Hemp into the rotation, you can’t go far without learning about the economic diaspora that took place when the demand for tobacco began to evaporate. As a high value crop, tobacco fit in well to the hills and holler’s that shape Kentucky’s topography. With hemps potential to offer multiple revenue points from a single plant there’s strong potential for it to fit well into the Ag system here in Kentucky. From that standpoint of impact I couldn’t think of a better place to grow roots for Victory Hemp Foods. Can you share what kinds of products Victory Hemp Foods sells? VHF is working to build the domestic supply chain as well as the market for hemp foods. We do that by bringing our Kentucky Proud (Grown and Processed) Hemp Oil and Hemp Protein to market with Hemp Hearts that are coming from either Canada or Colorado at this point. Building the supply chain involves more than just getting some viable seed in the ground and then harvested in the fall, we're working to connecting existing infrastructure to process, as well as develop our own proprietary equipment to process efficiently, effectively, and most importantly safely here in rural Kentucky. On the market demand side of the equation our company goal is to add value to the industry by expanding the category. While we are always going to be another brand on store shelves that a consumer can grab against another brand offering hemp hearts, we aim to develop products that incorporate hemp foods (oil, protein, hearts) as additives and ingredients to help fortify the nutritional profile as well as increase the demand for our farmers. Helping to develop more products that incorporate hemp into them with the intentions of getting major food manufacturers and brands off the sideline. Our work on the Kentucky Hemp Hotdog is a good example of breaking barriers and finding markets for hemp. Before this project hemp had never been approved for use as an additive or ingredient in meat products by the USDA. With the help of farmers and the Kentucky Cattlemen’s Associations as well as the KDA we were able to run this issue up the flag pole in DC and get the USDA to clear hemp for use in meat products which established a precedent for the entire hemp food industry. A line of Pasta and Tortillas are in the final stages of development also and we think they’ll be a fresh take on some classics. What are the benefits of buying/using hemp products? Hemp foods are nutritious and delicious; with the ideal ratio of Omega-6 to Omega-3 polyunsaturated fatty acids and a protein profile with all 9 essential Amino Acids, including L-Arginine as well as Magnesium, it's a superfood that our bodies can thrive on. In the supply chain, the impact of growing hemp can provide farmers with another crop to help diversify which can provide relieve from volatility in the commodities market. Studies show that hemp removes disproportionate amounts of Carbon from the atmosphere and the fibers really give us a resource that has the potential to replace the fossil fuels used in an enormous amount of the consumer products that we are surrounded by, from car parts to construction materials. Do you have a favorite hemp product use/recipe that you would like to share? I love Pesto. It's delicious fresh or frozen and I'm usually overflowing in basil in the summer months This recipe using hemp hearts isn't very different than traditional recipe... just fortified with the Hemp Hearts providing healthy oils and high quality protein! Pulse the hemp seeds and garlic in a food processor. Add the basil and pulse again. While the blade is running, drizzle in the oil. Scrape the sides of the food processor, if necessary, and pulse again. Season to taste... maybe some red chili flakes if you're feeling frisky. Vanessa Harmon, Founder V's Raw Protein Bars started making her clean products as a mom wanting a snack she could trust to feed her girls. She shares her story and her favorite Almond Chia protein ball recipe. Describe your role in the wellness community. What are some of your philosophies, beliefs and wellness routines? I have been in the fitness world as a personal trainer for over 12 years. I played every sport imaginable in high school. As I was approaching my senior year at USC, I decided to become a personal trainer. Working out for me is my therapy, my safe place to quietly invest in myself. I’ve always eaten clean. Growing up in Germany, junk food was not a option in my house. When you wanted a snack it was a piece of rye bread and a block of cheese. I raised my girls to eat the same way. Nutrition is 90% of what you look like on the outside and feel on the inside. Eating clean is just a way of life for me. What inspired you to start Vs Raw Protein? I started making my own protein bars for my girls when they were younger because I didn’t like all the processed ingredients in the store bought bars. I used all natural products and superfoods and played around until I came up with a bar my girls loved. What do you think makes your protein bars and balls stand out from others on the market? I have absolutely no added sugar in my products. The little bit of sweetness you taste is coming from the organic peanuts. My peanut butter is made specifically just for me. My bars have no preservatives, which is very rare in a protein bar, so they have to be kept cold or can be frozen. I use only the highest grade organic superfoods such as goji berries, spirulina, cacao, dark chocolate, chia seeds and flax. Tell us about your journey as a "wellpreneuer" and what you have learned as you've grown your business. My protein bars are currently sold in 42 stores nation wide. I am in all the I LOVE JUICE BARS across the nation including some smaller Juice Bars here in Nashville. This took me almost 4 years to grow with many ups and downs and I’m still learning everyday how to run this business. The great thing is I love what I do and look forward to going to my commercial kitchen everyday! Can you share a favorite protein and superfoods packed recipe? My favorite recipe right now (because it changes weekly) is, Almond Butter Protein Power Balls, simple and so yummy! Mix all ingredients together. Let it get cold, then roll into balls and cover with unsweetened raw organic coconut. Store in the refrigerator or freeze. Tammy Myers, founder of Cure Oils prides her company on the quality of her all natural essential oil products. She shares her wellness routine and favorite blends that solve problems that we often turn to medications for such as pain relief and stress. Tammy Myers, founder of Cure Oils prides her company on the quality of her all natural essential oil products. 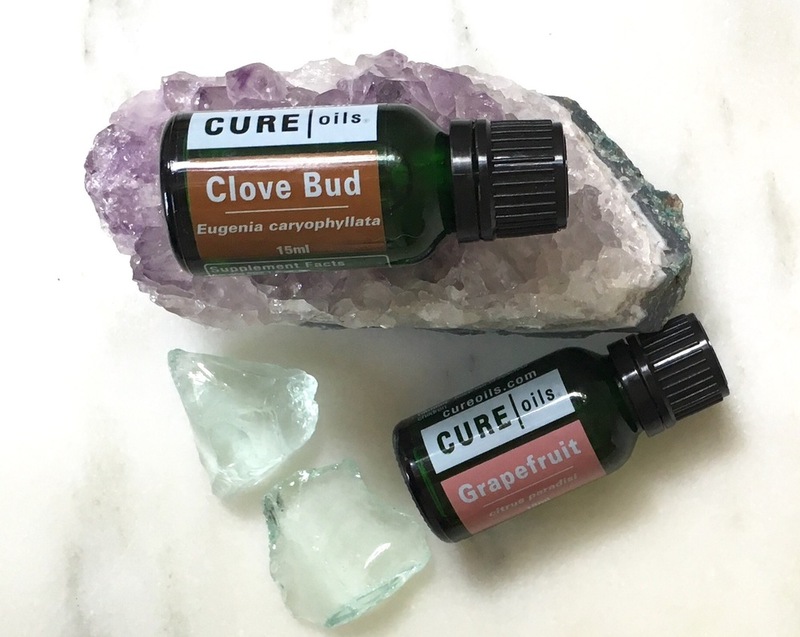 Sourcing and testing oils from trusted growers and distillers around the world, she creates blends that solve problems that we often turn to medications for such as pain relief and stress. Her background as an aromatherapist has allowed her to identify and create a perfect blend to solve many everyday problems. What is your overall purpose and mission, as the founder of Cure Oils? My business motto is: Integrity. We want our health conscious customers to have the best products at fair prices. We also want to facilitate education and ease of ordering, avoiding MLM strategies and buying requirements. Can you share a favorite wellness routine or ritual of yours? I love the simple routine each morning, when I shower, I place a few drops of Eucalyptus in the corner to promote breathing and makes my whole bathroom smell like a spa. I also have a Clean blend that is super concentrated that I love cleaning with it instead of chemicals. How have you overcome any challenges you have faced in your journey and do you have advice for other "wellpreneuers"? There are may challenges in my industry due to a few large MLM businesses that cause skepticism of the actual benefits and quality of many smaller companies like mine that provide a superior product, better customer service and real knowledge of oils. To combat this scenario, Cure Oils continues to educate customers by trained and certificate aromatherapists what is the truth and what is not. I believe real knowledge is power. My advice to others in this industry is to never stop learning and studying the science in your particular area of focus. I also think there are so many ways we can use our creativity to inspire new products, packaging and ideas that can benefit the world. I await the future in the wellness industry. What are your favorite essential oil blends? Describe some ways readers can replace chemical ridden products with essential oil blends. It's hard to pick a favorite product or oil that I prefer. It is like asking which child is a favorite. I love and use every product we make. My Repel blend, which is DEET free, insect repellent is a favorite for outside activities, this time of year. I also keep my Lavender handy during summer for all sunburns, rashes, insect bites, etc. I use the Allergy3 almost everyday during Spring through Fall to fight my seasonal allergies. I go first to essential oils for any ailment affecting me or my family. I could go on forever, but that is just a few. Do you have any new products that you are excited about launching? I have the following new singles available in September: Ginger, Cedarwood, Juniper Berry, Sweet Fennel, Cypress, White Fir, Cassia, Sweet Marjoram and Helichrysum. I have the following new blends available in September: Forever (anti-aging), Acne, Brave (Meditative Blend), Anchor (Grounding Blend - similar to Valor or Balance), Sprout (Children's Restful Blend), Calm (Restful Blend), Meditate (Grounding Blend), Studio (Prana/Yoga Blend), Vata, Kapha and Pitta (which are Ayurvedic/Dosha Blends). This pain relief roller is a must have in every gym bag. An all natural way to relieve sore muscles. Naomi Posner (Mama herself! ), founder of Mami's Gelato shares her journey to vegan gelato and tips for other wellpreneuers. Vegan and gelato are two words never heard in the same sentence. What inspired you to start Mami's Gelato and why make it vegan? I started Mami's because I've always loved gelato, and I wanted to prove that I could come up with an authentic gelato recipe that would stand up to even the best Italian gelato. I began developing a vegan option right away because I myself am lactose-intolerant and have strong sympathies with the animal rights movement. Once I put the first batch of vegan coconut gelato up for sale, the response was immediate and overwhelmingly positive. I knew I was on to something, and have continued to give my vegan and dairy-free customers what they want! What do you think makes your products stand out from other dairy free ice cream options? The most obvious distinction is that our product is gelato, which gives it a unique consistency. I don't really worry about standing out from competitors, in fact I haven't even tried most of them! I just focus what I like, and what my customers tell me they like. Having said that, I believe we are one of the only nondairy frozen desserts that doesn't use agave, which is an ingredient that causes issues for some people, including me. We will soon be switching to a non-GMO corn syrup (instead of regular corn syrup), which I am excited about. As a new and growing company, every day presents a new challenge! As a family business, we solve our problems by working together and openly discussing possible solutions until we agree. My advice to any entrepreneur is to build your team with people you can trust and lean on, and that you enjoy spending almost every hour of your day with. We are currently setting up our online pint store—stay tuned for updates on our official launch!